With fighters gathering together from Japan, South Africa, Brazil and Australia to showcase their tremendous skills and deliver over two hours of non-stop Mixed Martial Arts Entertainment that will not disappoint. Fighting under full A-Class rules will see BJJ Blackbelt and fan favourite Gustavo Falciroli taking on his toughest opponent yet in Dream FeatherWeight contender and dynamic striker ‘Wicky’ Akiyo in the main event. Brazilian born Gustavo Falciroli with only one loss to his name and an incredible ground game is coming off a huge KO win over crafty shooto veteran Masahiro ‘The Jackal” Oishi under Qld’s Rize promotion. Gustavo hopes to keep his winning momentum going while lately preferring to finish his opponents with his shotgun righthand. ‘Wicky’ Akiyo at only 26 years old brings a wealth of experience to the fight along with his unorthodox fighting style. Having fought in top Japanese promotions he is yet to be submitted or KO’ed in over 15 professional fights. ‘Wicky’ will look to upset the Brazilian badboy with his top striking and ground defense. Also fighting is Qld based Coby Jones training out of 5 Rings Dojo who will face southwest MMA fighter and big wave surfer Sean Spooner in what will be a cracker at middleweight. Perth’s own crazy hat wearing Wes “The Decapitater” Capper will square off against Boochu Thai boxer Ryan Mitchell trained by the famous JWP. Undefeated pro boxing sensation Erin McGowan will take on Queenslander Eileen Forrest who with over 15 pro fights and has promised to break Erin’s winning streak. Both girls know that a win would place them at the top of Australia’s rankings. Coaches with fighters @ around 76kg, 83kg and 91kg please contact Habby on 94431227. 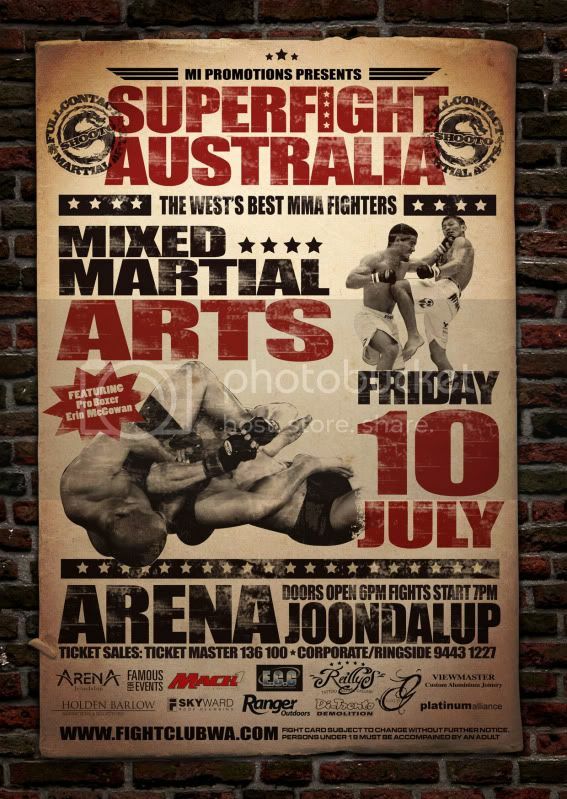 This is a good opportunity for your fighters to get their names on the Australian MMA scene.